Solar energy, helio systems, solar panels, collectors, equipment for water heating and space heating using solar energy and everything about solar energy. 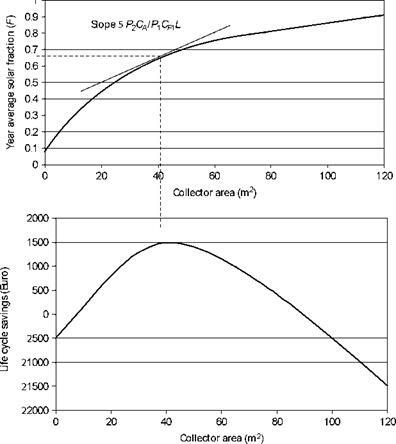 FiGURE 12.3 Optimum collector area determination from the slope of the Fversus Ac curve. Pi = ratio of life cycle fuel cost savings to first-year fuel savings. P2 = ratio of life cycle expenditure incurred from the additional investment to the initial investment. When a solar energy system is designed, the engineer seeks to find a solution that gives the maximum life cycle savings of the installation. Such savings rep­resent the money that the user/owner will save because of the use of a solar energy system instead of buying fuel. To find the optimum size system that gives the maximum life cycle savings, various sizes are analyzed economically. When the present values of all future costs are estimated for each of the alter­native systems under consideration, including solar and non-solar options, the system that yields the lowest life cycle cost or the maximum life cycle savings is the most cost effective. The example in this section considers a complete solar water heating system. Although different solar energy systems have different details, the way of han­dling the problems is the same. The first example is about the fuel cost of a non-solar or conventional energy system. It examines the time value of an inflating fuel cost. Calculate the cost of fuel of a conventional (non-solar) energy system for 15 years if the total annual load is 114.9 GJ and the fuel rate is $17.2/GJ, the mar­ket discount rate is 7%, and the fuel inflation rate is 4% per year. (because the total annual load is given, the integral is equal to 114.9 GJ). In life cycle cost analysis, all anticipated costs are discounted to their present worth and the life cycle cost is the addition of all present worth values. The cash flow for each year can be calculated, and the life cycle cost can be found by discounting each annual cash flow to its present value and finding the sum of these discounted cash flows. Life cycle costing requires that all costs are projected into the future and the results obtained from such an analysis depend extensively on the predictions of these future costs. Copyright © 2019 Everything about solar energy - Solar energy, helio systems, solar panels, collectors, equipment for water heating and space heating using solar energy and everything about solar energy.